~Chloe is a genius! One of the best therapists I've ever met, and I've tried them around the globe. She excels not just because she is knowledgeable and experienced, but because she is so dedicated and focused on healing her patient. Its one thing to receive a nice massage, its an entirely different thing to feel how present and connected Chloe is during a session. Its rare to find this, not just in a massage therapist, but in most people these days! For this reason, Chloe is a great healer! If you want results, then Chloe is the person to go to. The last time I had a session with her, I went in with my allergies flared up so bad that my left eyeball was bubbled up with redness. In just one reiki session it was completely healed. My eye looked totally normal after just one hour! Chloe is very intuitive, and she tailors your session around what your body needs in order for you to get maximum relief. I am in pretty good shape - I eat right, muscle train everyday, and sleep just the right amount of sleep every night. But I work a lot. What can I say, I love what I do, and I get paid a lot to do it. But what would I do without Chloe?! I go to see her because she works out every knot in my back until they are all gone. She understands how the stresses of life can impact your body, mind, and spirit. And the reason why she's amazing is because you truly sense that she cares about your health and well-being. If I can say one thing about her massages, it would be this: She is so good at what she does, sometimes you feel as if she had six hands working on you at the same time. What I would say about her Reiki treatments is this: She is a natural, and you KNOW that when she's working on you, you are in the midst of a truly deep and sacred healing! One last thing I have to say is that if you are auditory, you're in luck! She has one of the sweetest, soothing, and of course, healing voices I know. I received one of the best massages I've ever had from Chloe. I love deep tissue work and she is so strong and completely unafraid to go DEEP! Her combination of Shiatsu, deep tissue and trigger point work is amazing. She has that perfect balance of having a firm touch without being rough or harsh. In fact, her manner is very soothing and calm. My shoulders and upper back felt so alive and tingly after the massage. I had much greater mobility in my muscles. I'm looking forward to more massages from her. I encourage you to give yourself the gift of a wonderful massage from Chloe! ~Chloe is a miracle worker! Before I started seeing Chloe, I had a chronic pain (felt like a pinched nerve) on my left shoulder acquired from the strains of working on a computer all day. I tried several Massage Therapists and while I felt more relaxed and the pain numbed after the session, the pain would always come back. I pretty much thought it was helpless and that I would just have to live with the pain. I was referred to Chloe by my best friend and her sister -we are all religious Chloe clients! With a combination of techniques (shiatsu and deep tissue), Chloe has helped me alleviate my chronic pain only after a few sessions. To my surprise, by the 5th session I didn't even feel the painful spot anymore. Chloe is very attentive and responsive to your needs. She listens to you and your body. Everyone should have a Chloe session! ~Chloe is simply the most talented that I ever met and the first who was able to heal me. Over the last 5-10 years, I have been accumulating lots of stress from several start-ups that I created. It's been worst and worst with the stress, the computer 24/7, a bad sitting position, a bad sleep sometimes... Until I meet her. I met many many professionals in California, in Maryland, in Europe (chiropractors, massage therapists, etc etc). Chloe is the very first one who managed to show significant progress on the long-term with my back, my shoulders and my arms. `~If everyone could get a massage like the one I just got from Chloe the world would be a better place! She is so strong, and yet so gentle; I trust her to go deep enough to get at the tension, but to make it such a pleasant process I come away from the session very relaxed and with a feeling of contentment. I have had a nagging hip pain that has virtually disappeared since she has been working with me. I have already recommended her to a few friends, and plan on giving a special someone a gift certificate. Chloe has been an integral part of my recovery from chronic pain issues, which I experienced for several years. 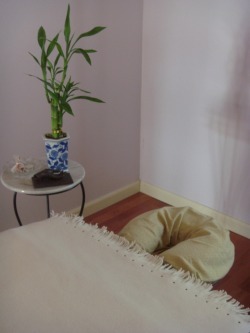 With me, she has been using a combination of techniques such as Deep Tissue, Shiatsu and Reiki. Chloe truly cares about her clients, and I always felt a very collaborative relationship with her as my massage therapist. She is extremely talented and intuitive, and also does an outstanding job of communicating and working with me on self-care to get the most of my visits with her. Lastly, I appreciate the fact that she stays current with new developments in her field. Chloe is fantastic!! ~Chloe is the kind of woman who does what I call "working massage." You go in there with a problem and you come out with it solved and feeling soooo much better. I go to her whenever I get knots or kinks in my back, shoulders, or arms and she always solves the problem. She also encourages you to really focus during the massage to help release the knots. Her fingers seem to know just where to press, too. ~There are few healers and body workers that are truly gifted with a unique ability to not only heal the body but also lift the soul. Chloe La Bare has that gift and if you are fortunate enough to schedule a massage with her, please know that your spirit will soar. She is truly gifted and a fabulous masseuse. ~Before Chloe, I believed that massages were self-indulgent sessions that I would sign up for at a day spa. I was wrong. Chloe has worked wonders with my hip pain that I had during my second pregnancy. Even after giving birth, I continue to see Chloe on a regular basis because her sessions has helped me maintain a painfree lifestyle that once included hip and shoulder pain, as well as tension. I have referred Chloe to my family and friends and they have all thanked me for the introduction; some have even become regular clients. In summary, I highly recommend Chloe, once you've had a session with her, you probably won't view massage as a self-indulgence anymore. and wishes. She is also very friendly and attentive, with ones comfort always in mind. Chloe is excellent at reading ones body and working out the problems she finds, so in my case; she used a blend of Swedish Massage and Deep Tissue to work out the tension I was carrying in my back from full-time bar tending, and added in Shiatsu where she felt I needed energizing. I came out of my first session feeling the best I had in ages, and have been back many times since. I owe her many thanks and would happily recommend her to anybody in need of a massage.